Launched in 2017, ICNC’s Special Report Series aims to bridge the gap between academic, policy and other practitioner communities. ICNC Special Reports draw on cutting-edge research to cover topics pertinent to the ongoing policy discussions and practitioners’ debates around issues relevant to civil resistance movements, grassroots campaigns and nonviolent struggles taking place around the world. What drives governments to crack down on and kill their own civilians? And how—and to what extent—has nonviolent resistance historically mitigated the likelihood of mass killings? This special report explores the factors associated with mass killings: when governments intentionally kill 1,000 or more civilian noncombatants. 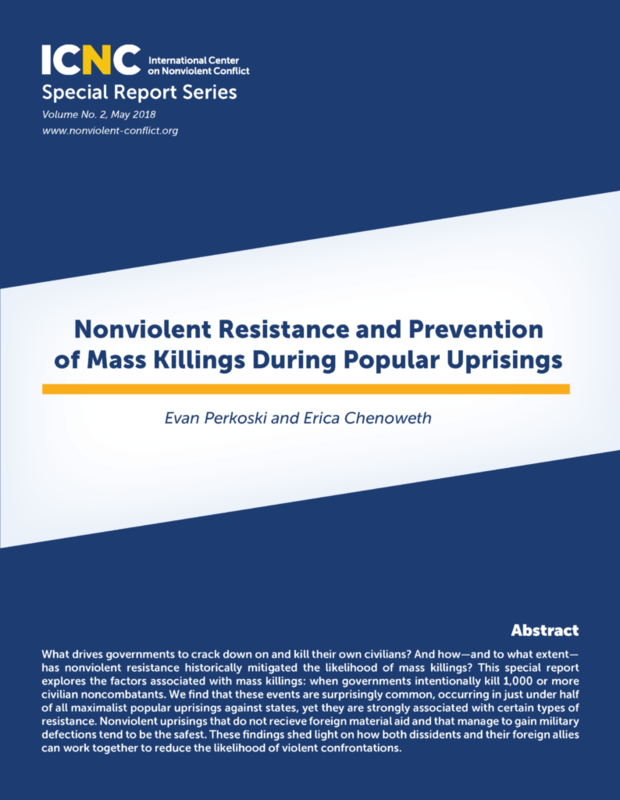 We find that these events are surprisingly common, occurring in just under half of all maximalist popular uprisings against states, yet they are strongly associated with certain types of resistance. Nonviolent uprisings that do not receive foreign material aid and that manage to gain military defections tend to be the safest. These findings shed light on how both dissidents and their foreign allies can work together to reduce the likelihood of violent confrontations. This report explores the complementary ideas and practices that civil resistance and peacebuilding approaches present, each from different points along the conflict transformation spectrum. Both strategies oppose violence in all its forms, and seek to pursue just peace by peaceful means. However, they take different approaches to conflict transformation, both in their analyses of the primary causes of violence and how they respond to conflict. The report then describes how civil resistance and peacebuilding can work in tandem throughout the four stages of transformation of asymmetric conflicts. Concrete examples are provided to illustrate the respective functions of constructive conflict (through civil resistance) and conflict mitigation (through peacebuilding) in transitions from latent to overt conflict, from resistance to dialogue and negotiation, and from conflict settlement to sustainable peace. ICNC’s Civil Resistance and Peacebuilding Case Studies Report features in-depth research and analysis on the interplays of civil resistance (CR) and peacebuilding (PB). 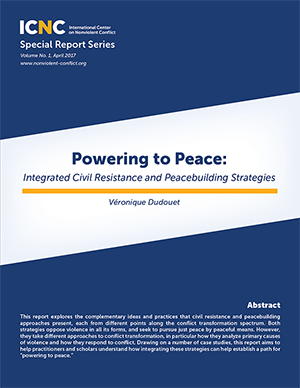 These case studies are based on the analytical framework developed by Veronique Dudouet in the ICNC Special Report, Powering to Peace: Integrated Civil Resistance and Peacebuilding Strategies, and provide illustrative and specific examples from single, country-specific conflicts. These studies demonstrate how civil resistance and peacebuilding strategies worked together or separately in four identified phases of violent conflict: (1) latent (2) overt (3) settlement and (4) post-settlement. After receiving 20 applications, ICNC selected a case study on Macedonia and a case study on Nepal. The published case studies will be available to the public in the Fall of 2018.